Send powerful message & blessings to friends! Beautiful & Perfect for Christmas...!!! These Christmas cards have the perfect message that I want to convey at this time. Really love these..!! I bought this card last year. It gave me chills when I read it. Quite a few people I sent it to absolutely loved it. I thought it was the best Christmas card ever. I will send them to all on my Christmas Card list. The words are so touching they went straight to my house I would definitely buy these Christmas cards again. I had so many positive comments from the friends & family that received it. Will order more for next year. I was not going to send Christmas cards this year but then I saw this card and had to have it to send to all of my friends. The letter from Jesus was what did it for me. Thank you so much for this card. Beautiful cards for Christmas. Says it all! I have been buying my Christmas Cards from Miles Kimball for years and love them. They are made of good card stock and every time I have gotten them everything was done just right. This product is exactly what I wanted. Beautifully done ! Very satisfied with this product ! 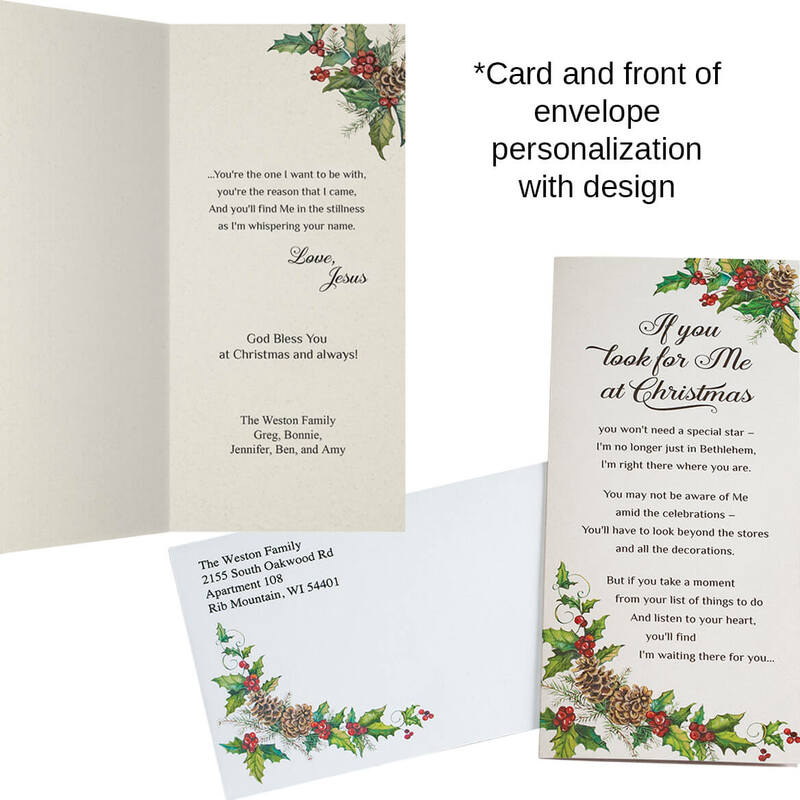 I read the reviews saying this Christmas card was small. Well when I saw the cards, yes they are small but to me it was like getting a very personal letter and I like that. I am always looking for a very different and unique card and when I saw this one online I had to order right away and wasn't disappointed. I have told numerous people about this wonderful card!!! Very beautiful cards...much nicer that expected. imprints looked extremely professional. I think these cards are beautiful. 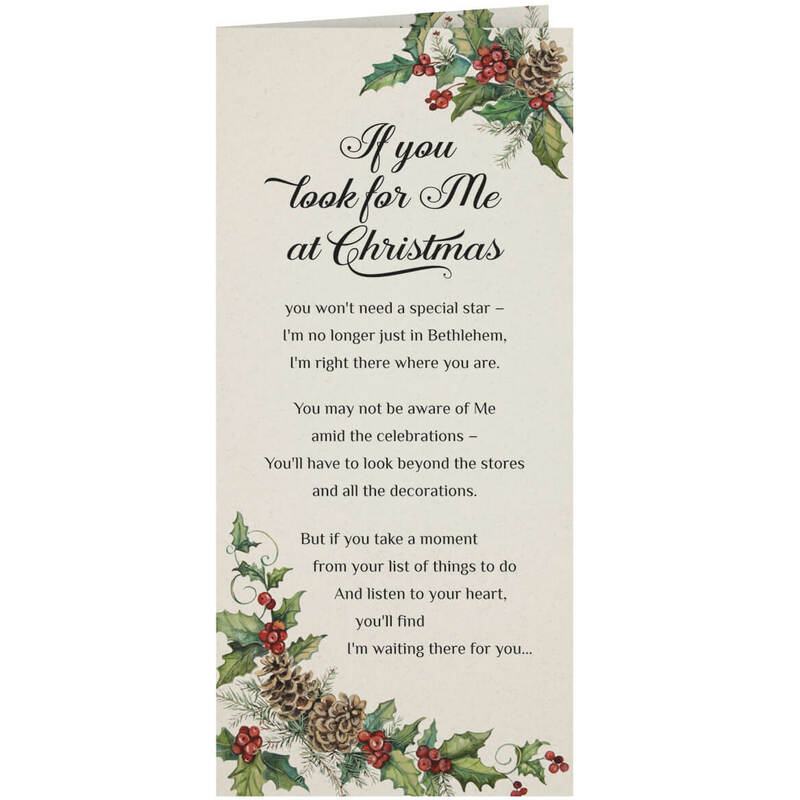 I was looking for a Christmas card that was different from the rest, and found it. When I first read the card it brought tears to my eyes. Anything that can do that I have to buy! I know everyone I send this card to will love it too. I would buy cards through Miles Kimball again. I feel I received high quality Christmas cards for the price I paid. Keep them coming! These cards are just what we wanted for Christmas sending. The only thing I would have preferred would be colored coordinating envelopes. Yes, I would buy it again! The quality of the cards is great; the coloring and wording is fantastic. I would have given this product 5 stars but the cards are smaller than I expected. I thought the length would have been longer but it is still a great product for the money. The quality of card stock and the envelope is very good. Like the address being imprinted on the envelope and our names on the card. However, the card itself is much smaller than my husband and I expected it to be. I stick a letter in the card and now I will need to fold it smaller. It would have been much better if the size of the card was that of a standard card, for example 5-1/2 x 8-1/2. I have always loved your cards. However, this year I must not have paid attention to the size. This looks like a larger card by ad but it is actually quite small. I'm sure the feedback I get this year will not be a favorable as in past years. We loved the cards so ordered 40 but when they came we were so disappointed. We thought the last sentence on the card was an example and we liked it so added it and now our cards all say the same thing twice so they are ruined. I liked the message the card conveys. does this card have glitter on it? BEST ANSWER: No it does not. And it is so beautifully colored, it does not need glitter and trust me I am a bling person. The more glitter the happier I am, but this precious card did not need it. Thank you for your question. This item is not coming up on our website so it must be sold out. We apologize for the inconvenience. We hope this information will be of help to you. BEST ANSWER: Thank you for your question. The card is 3.5 x 7. We hope this information will be of help to you. i do not want the cards personalized and can't find window to say no. 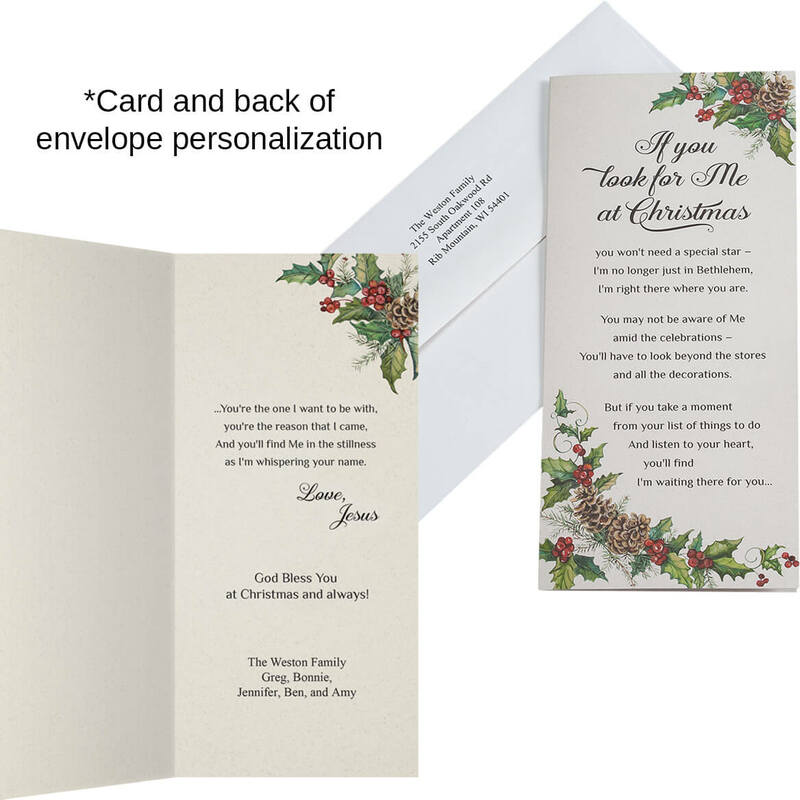 Where is box to say no to personalization of cards? when will personalization become available for this card? BEST ANSWER: Thank you for your question. Unfortunately the card has sold out. We no longer have inventory and are not expecting further shipments from the supplier. We hope this information will be of help to you. When I try to order these cards the page does not respond. How can I order these? BEST ANSWER: Thank you for your question. If your item does not come up on the website it is probably retired. We hope this information will be of help to you.